Today, I am hopping for the first time with the Unity Design Team. I am very happy to be a part of this team and excited to create for this amazing company. The hop links are below. It ends at the Unity Blog and the stamps are found at the Unity Shop. 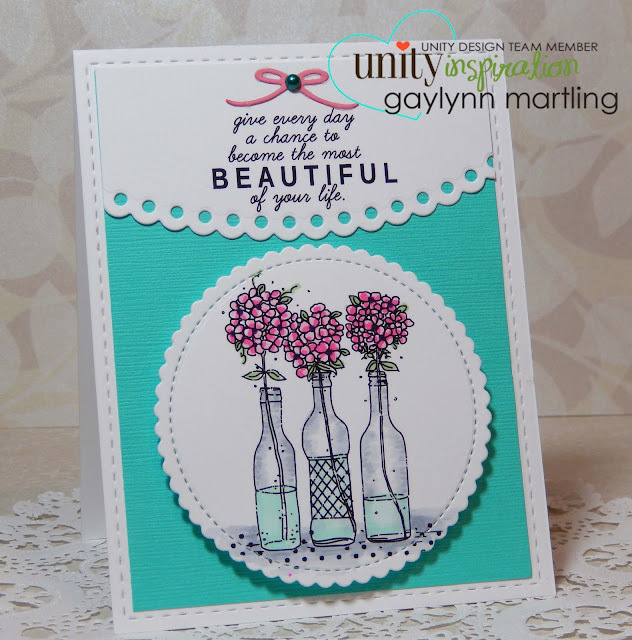 This card is made with the June 2016 Kit of the Month Beautiful One. stamping with masking. It incorporates the two flower stamps in the kit. I am also sharing creations with some of the Unity sale items. This is the new kit Substance of Things by Phyllis Harris. And here is the new Be Present by Phyllis Harris. With the new Unity kit called PMS Peggy. And finally with the new kit called You Prick. This is a watercolor card, mixed media style. Sentiment: Kind heart brave soul. This is going to my husband today for our 28th wedding anniversary. He has a kind heart and is brave for putting up with me all these years, haha. 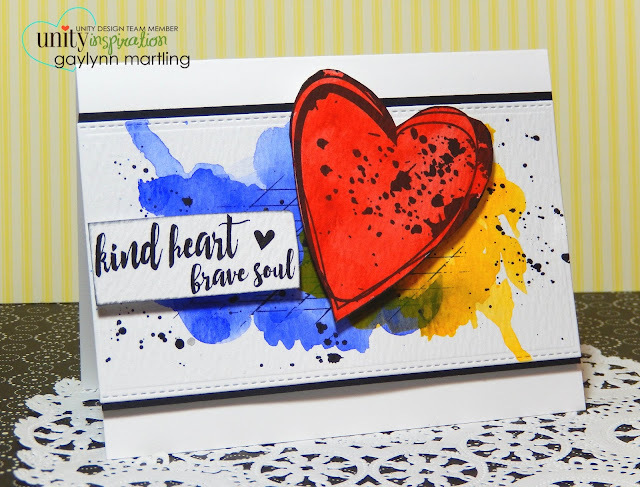 I was drawn to this big heart, so I made this card bold with color and with an artsy look to it. This kit is a scrapbook / mixed media kit, but can easily be incorporated into a card. Supplies: Unity Layers Of Life Find Your Wild, Sakura Koi watercolor paint, brushes and MFT dies. 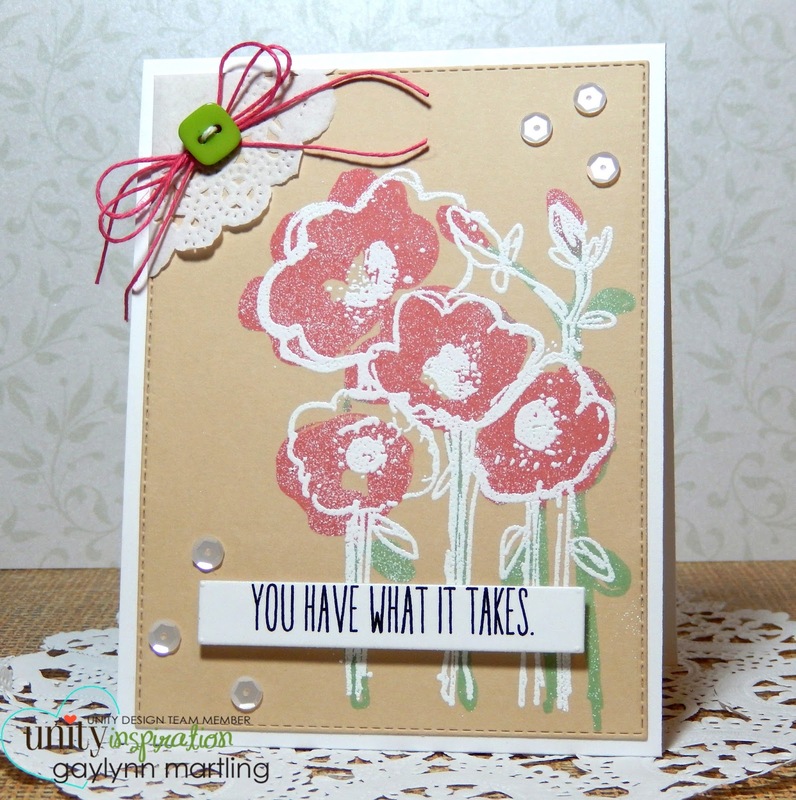 This is an encouragement card with pretty flowers and glitter accents. Sentiment: We believe in you. 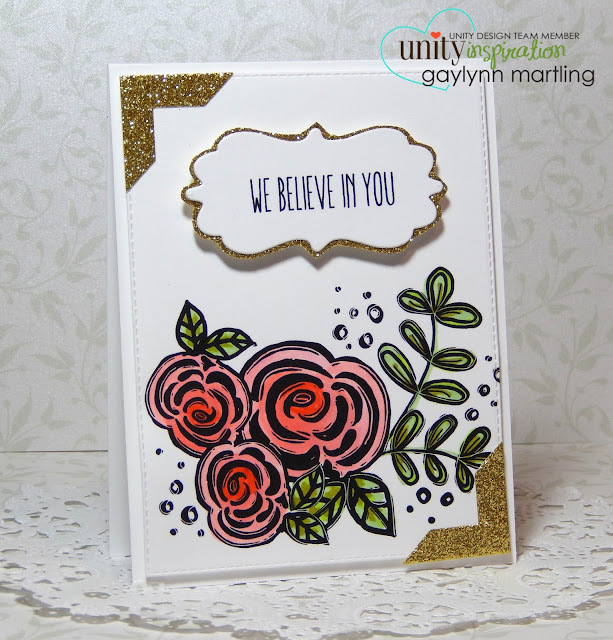 To accent the coral flowers and sentiment, I added bits of gold glitter paper. Copics on the leaves and distress marker on the flowers. Simon Says Stamp Wednesday Challenge ~ Add some shimmer. Supplies: Unity KOM June 2016 Beautiful One, Copic markers, distress marker, watercolor paper, dies from My Creative Time and My Favorite Things. This is a sweet garden card featuring a cute chipmunk. The top panel is watercolor and the bottom is colored in with Copic markers onto tan kraft color card stock. For the chipmunk panel, stamp with permanent ink on watercolor paper for best results. With a distress marker, dab a small section of the image where you want the color the darkest. Then quickly use a small brush dipped in water to pull the color through the image. Do this in steps. Dry between colors. Blot the brush onto a paper towel to remove excess water on the brush. You can also brush the marker onto a plastic pad or acrylic block and then pick up the color from there with the brush. For this example I used paint brushes instead of a water brush to get finer detail. To remove excess water from the paper or to lighten the color in an area, rub the brush onto a paper towel and then dab the brush on the water spot. Repeat for desired color or effect. To spread color around a larger area, brush the paper with water before coloring using a wide brush or spray mister with only water. While the paper is still wet, dab the brush with watercolor onto the wet areas of the paper. The color will flow around the paper wherever the water is. Let dry and then repeat the areas to accent darker sections or to blend colors. Dry between colors and layers, using a heat gun or leave to dry naturally. To flatten warped paper, cover with a heavy book or block for a while. Just want to say that I am not a professional painter, far from it. These steps are what I have found to be most helpful to me while using these materials. The options are endless. The best part is to see the water do the coloring for you and the beauty of imperfection. Little Red Wagon Challenge #347 Kraft-tastic! 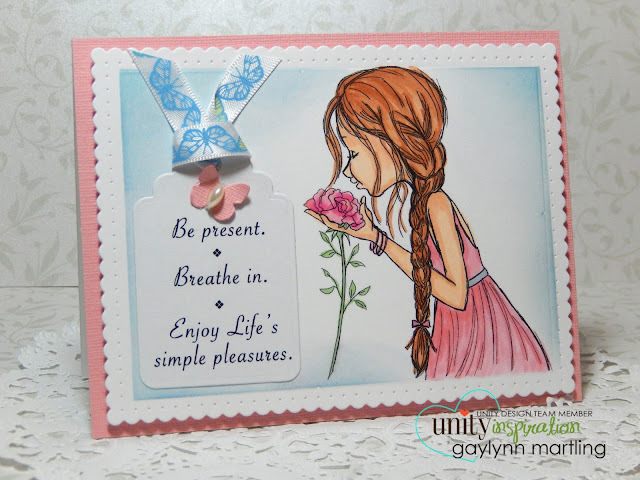 Supplies: Unity Stamp of the Week Wonderful Gift & KOM 3/2015 Always Begin Again, Tim Holtz distress markers, paint brushes, watercolor paper, Copic markers and MFT dies. It would be great to hear from you. I appreciate your comments, tips or suggestions. Today, I am sharing a watercolor woodland deer card that is embossed. The deer was colored in with watercolor onto watercolor paper and then the image panel was die-cut. To get the background look, I inked the inside top portion of an embossing folder before placing the paper inside. After it is embossed, the ink leaves this rustic look on the paper. This will look less bold if tan card stock is used to emboss, but has the same rustic effect. For trim, I added a solid panel with ribbon tucked around to the back and popped up the sentiment panel. Supplies: Unity Woodland Deer, watercolor paper, wood grain embossing folder, Ranger Coffee archival ink, Sakura Koi watercolors, brushes, Spellbinders die and ribbon. Celebrating summer with this bright beach style card. Sentiment: I love having a friend that's more like a Sister. This is has a tropical sunny look to it. These Angie Girls are accented with tiny rhinestones and beachy flags. Supplies: Unity More Like A Sister, Copic Markers, rhinestones and Winnie & Walter dies. Here is a woodland fox card that can be for either a man or woman and great for graduation, going away, encouragement and more. Sentiment: Go out and put beautiful things in this world. This image is so beautiful, all it needed was a little color and framing with a border. 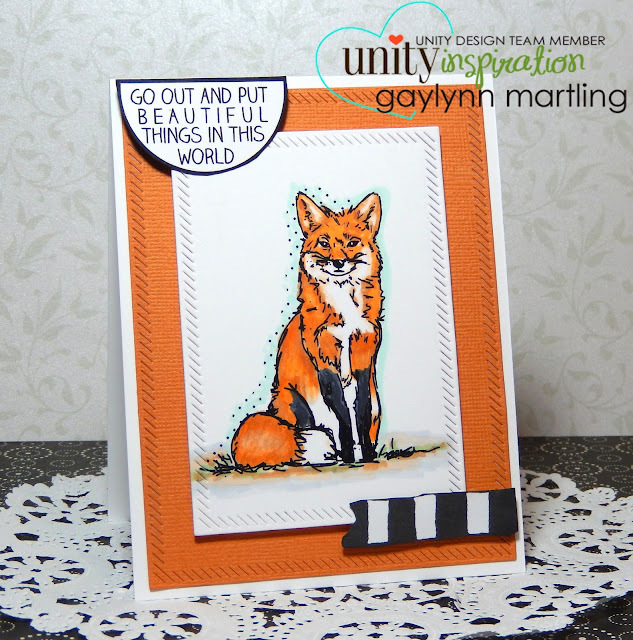 Supplies: Unity Stamp Co. Woodland Fox and A Bit of Washi, Copic Markers, MFT dies and SSS intense black ink. 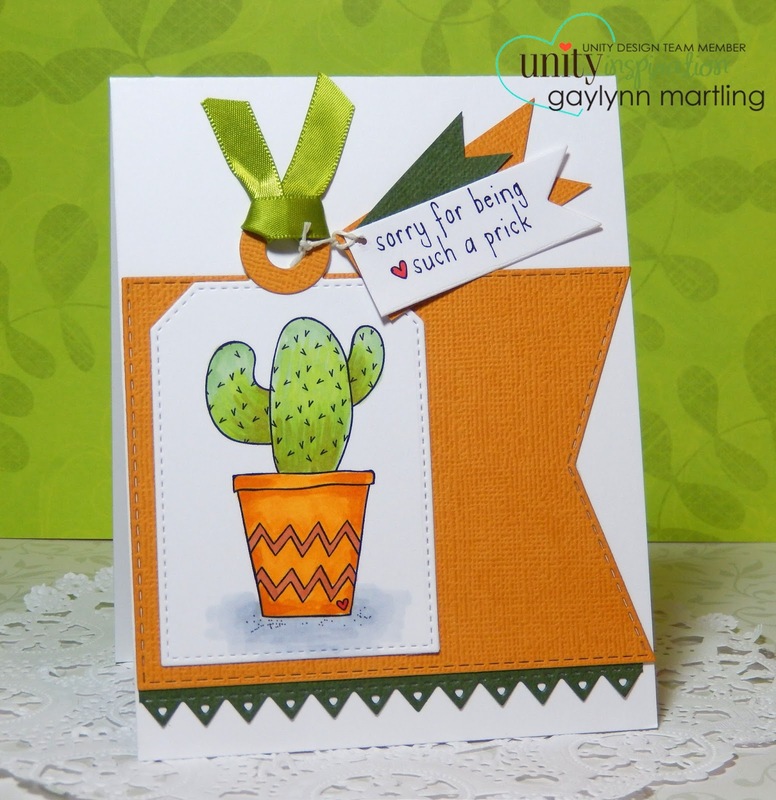 Sharing succulents on a card for any occasion. 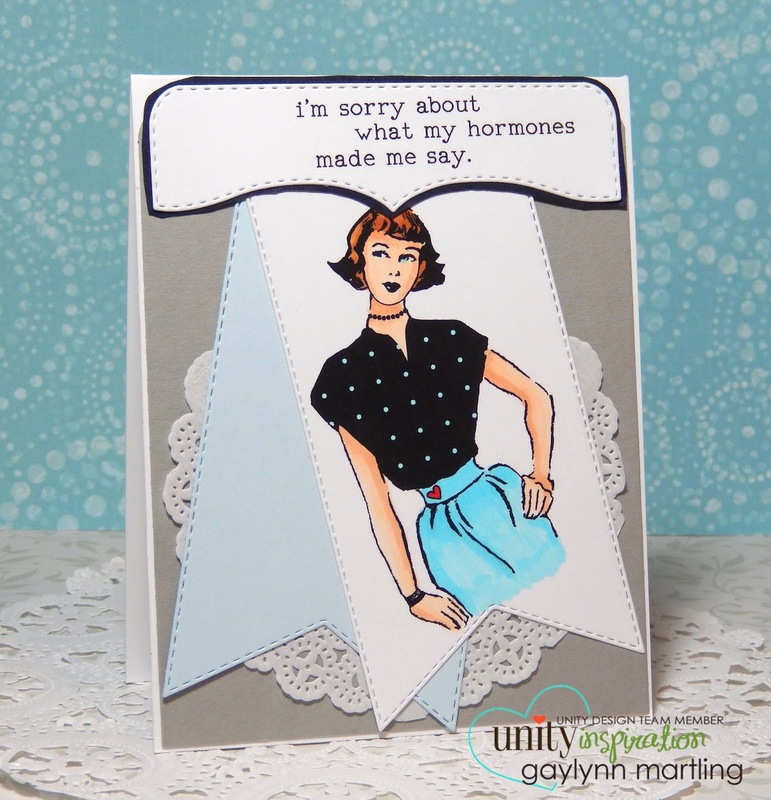 Sentiment: This card is filled with lots of love, hugs and happy wishes. Here are some of the steps. I used watercolor pencils on the plants and you can see the difference once water is added. I used distress markers on the vases. The bottom trim was die-cut. I added a stamped polka dot panel at the bottom, sentiment tag and a die-cut heart embellishment. Supplies: Unity Succulent Salutations June 2016 sentiment kit and Dots For Sure stamps, Derwent Inktense watercolor pencils, distress markers, water brush, My Favorite Things dies, watercolor paper and Misti. So, this post is dedicated to just that ~ LOVE. These are two of the newest release stamp kits by Unity which are part of their sale this weekend. And also this weekend, Unity is donating to charity. Stamp the image onto white card stock, then color the image. Using any shape, punch or die-cut over part of the image. Line up the loose shape exactly where the window of the image panel is and adhere the loose shape to the card base. Make a small pouch of sequins in clear plastic. I used a small photo sleeve, added sequins then fused the open end closed with a fuse tool. You can also glue or use double sided tape for closure. Tape the pouch edges to the back portion of the top image panel. Place the top panel onto the card base with craft foam or foam tape. 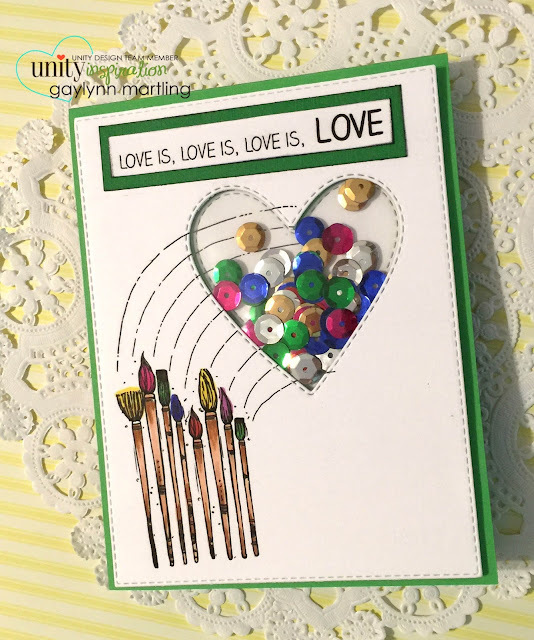 Supplies: Unity Stamp Co. Love One Another and Your Own Rainbow kits, My Creative Time dies, MFT dies, fuse tool, sequins, craft foam and Copic markers. Here is a woodland owl card in watercolor and with a stencil. Sentiment: So proud of the person you are becoming. This is going to be for a masculine birthday but I think it could work for anyone. To get this look, stamp the owl onto watercolor paper. Watercolor it with distress markers and a water brush, then dry. Trim or die-cut a center oval and place a small piece of ribbon accent. For the border, place a stencil onto the card base and softly rub with foam and distress ink. Stamp a sentiment. Place the oval and the sentiment with craft foam or foam tape. Supplies: Unity Woodland Owl and 6/2016 KOM Beautiful One, stencil, Ranger distress markers, distress ink pads, foam applicator, water brush, watercolor paper and Lil' Inker Designs die. Please let me know if you would like to know more on how I made something that you see here on my blog or my Facebook page. 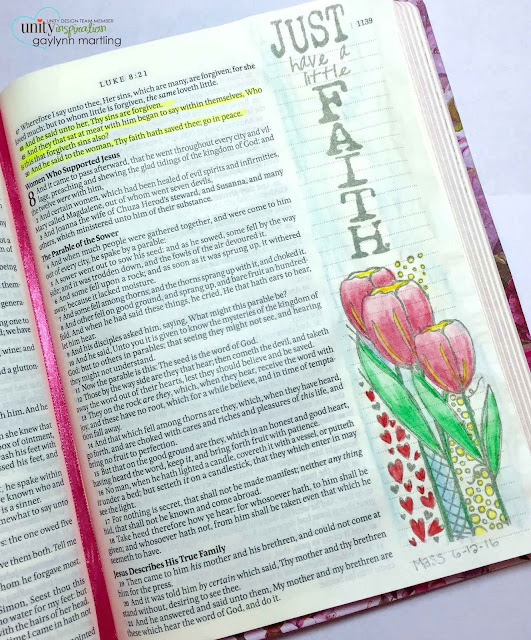 Bible Journal ~ Just have a little faith. Today I am sharing a bible journal page. And here are some of the supplies I used to decorate it. This was inspired by Sunday morning's church mass gospel. At the time, I knew nothing of the tragedy in the early morning hours in Orlando. My heart hurts. There are no words. Supplies: My Creative Bible, Unity stamps Have A Little Faith, Derwent Inktense watercolor pencils, brushes and MFT ink. Spread love. ~ LOVE wins. Here is a decorated gift card holder, perfect for so many occasions. Sentiment: I have something special just for you. For this gift card holder, I stamped and colored these pretty flowers in Summer colors of yellow and orange. Then I added a strip of patterned paper near the top, twine and a brad. The folded size is approximately 3.75" x 3.75". For the base, I used a die, but it is easy to make something similar. Trim a white piece of card stock 6 3/4" x 4". Score at 3". Punch the top portion with an edge punch of choice. Trim patterned paper for the inside top portion. Punch with the same edge punch, then adhere to the top. Stamp and decorate the bottom flap. Tape your gift card inside or cut two placement slots. For closure, tie with twine or cut a small U shaped tab. 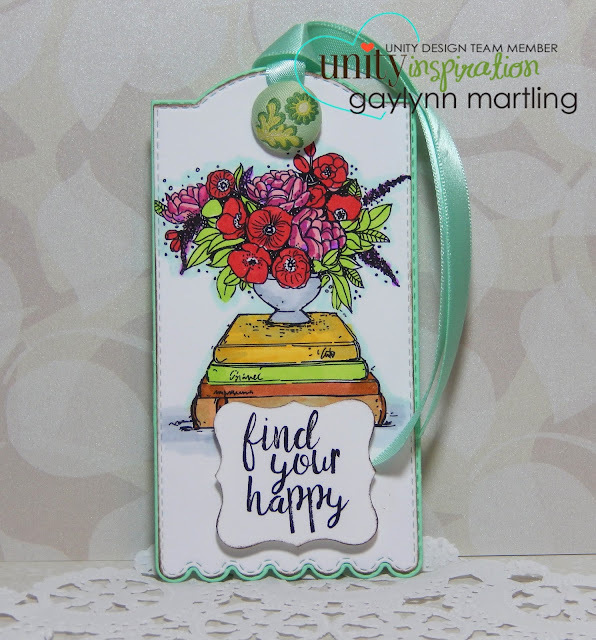 Supplies: Unity Stamp of the Week Blooms A Plenty, My Creative Time embossed gift card holder die, Copic Markers, twine, brad, My Mind's Eye paper. You guys, look at these bottle style flower vases. Sentiment: Give every day a chance to become the most beautiful of your life. Seriously sweet image, isn't it? It is this week's Stamp of the Week at Unity. This was colored with Copics and panels were die-cut with scallops and stitches. Supplies: Unity Stamp Co. Stamp of the Week A Chance Every Day, Copic Markers, dies by My Favorite Things, Lil' Inker Designs and Pretty Pink Posh. This is a tag or bookmark with pretty flowers on a stack of books. I like the message and decided that this should be made into a tag style bookmark. The books and flowers are colored with Copics in happy colors. This is one of the newest stamp kits released and on sale today at Unity. Supplies: Unity Stamp Co. Books & Blossoms, My Creative Time tag dies, Copic markers, ribbon and brad. I hope you have a "happy" day. A bicycle ride is always a good idea, especially with flowers. Sentiment: It's not about the destination, it's about the ride. I think I like the sentiment as much as the bike. 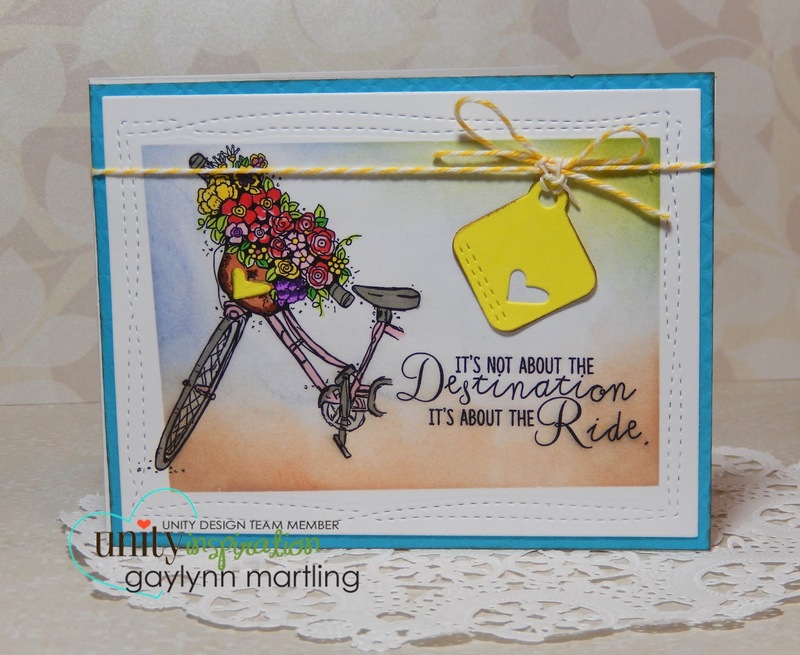 This background was made by blending distress markers with a foam applicator, after masking the sides. I think it turned out looking like a dreamy scene. The stitching on the edges and the tag put me in mind of bike trails. Supplies: Unity I'd Go Anywhere stamps, Copic markers, distress markers, foam applicator, Avery Elle dies and twine. This is an extra special post. I get to be one of the newest Unity Stamp Company design team members. Gosh, I am so happy about this. Eeek! Today I am sharing a card using the new Kit of the Month June 2016, Beautiful One. Here is a pic of the process. I colored her in with copic markers and then die-cut a couple of panels. I used a narrow strip of decorative paper, popped up the image panel with foam tape and then added a few decorative accents.